There are certain actors who can walk into any film and make it better simply by being themselves, whether they're colorful free spirits, wise old curmudgeons, or NERDS! Here to make any drink better simply by being its spicy self, the Captain Morgan Lime Bite. Brand new from the Captain, the Lime Bite's a silver lime-spiked spiced rum specially formulated to taste great with beer or lemon-lime soda, but that'll also add a swashbuckling punch to juice, energy drinks, or cola -- or as some call it but shouldn't, "pop". Beyond barbecues, pool parties, and other festivities that might or might not involve shirtlessness, you can also mix the Lime Bite into nightclub elixirs (the sour-addled "Lime Assault"), sports bar slingers (the Goldschläger-ific "Big Red Bite"), and even pub standbys, as with The Irish Bite: THE IRISH BITE 1 oz Captain Morgan® Lime Bite .5 oz Bushmills® Irish Whiskey Splash of ginger ale Shake and strain first two ingredients into a shot glass Top with ginger ale To explore everything the Lime Bite can do for you/your beverages, just hit the Captain Morgan Facebook Page -- and remember, whether you're a free spirit or a nerd, cocktailing well is the best revenge. 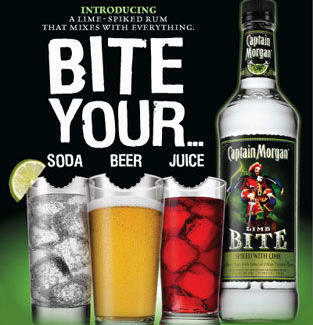 Bite into spicy bliss at the Captain Morgan Facebook Page Captain Morgan Lime Bite. Puerto Rican Rum with spices and other natural flavors. 35% alcohol by volume. Copyright 2010. Captain Morgan Rum Company. Norwalk, CT. Party Responsibly – Captain's Orders!